Wood, James . "Canadian Women's Army Corps". The Canadian Encyclopedia, 24 July 2017, Historica Canada. 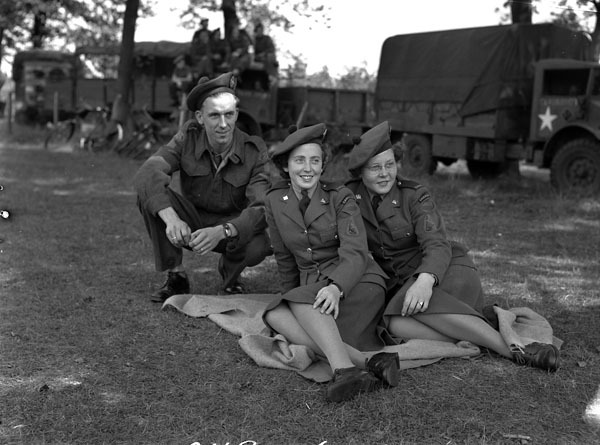 https://www.thecanadianencyclopedia.ca/en/article/canadian-womens-army-corps. Accessed 23 April 2019. During the Second World War, Canadian women, for the first time, were mobilized for service in the Canadian Armed Forces. Of the roughly 50,000 women who enlisted, more than half served in the Canadian Army. Most were assigned jobs involving traditional female work such as cooking, laundry and clerical duties, but women also pioneered roles in the mechanized and technical fields. The Canadian Women’s Army Corps (CWAC) performed essential services, both at home and overseas, that helped bring about Allied victory. 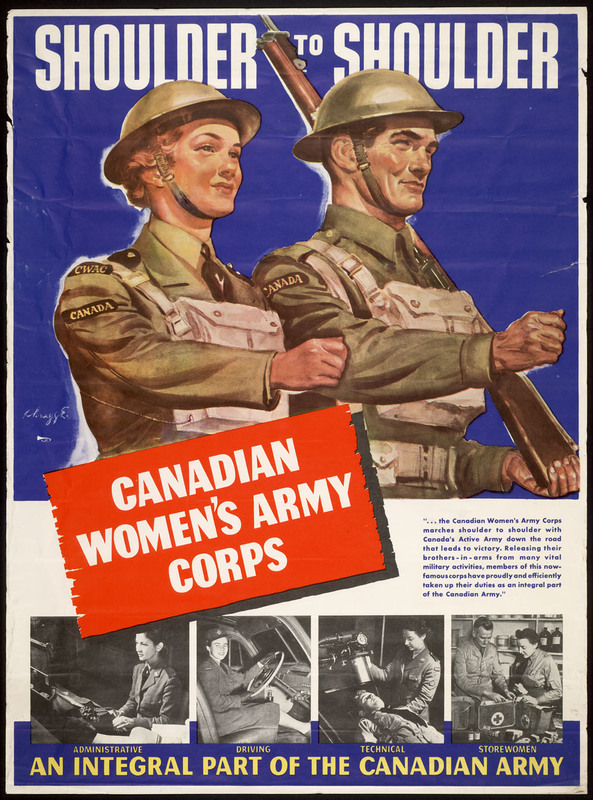 Faced with a manpower shortage in war services and production, the Canadian government announced, on 13 August 1941, the formation of a new Canadian Women’s Army Corps. Women would be recruited to carry out many of the support and clerical jobs that soldiers performed, with the goal of freeing up men for combat. Matron-in-Chief Elizabeth Smellie of the Royal Canadian Army Medical Corps was seconded to organize the CWAC, and toured the country to select officer candidates. Joan Kennedy was appointed general staff officer for training, and Margaret Eaton as director-general. Alice Sorby commanded the CWAC overseas and became deputy director-general. On 13 March 1942, the women’s corps became fully integrated into the Canadian Army. Accepting women as members of the Armed Forces was often difficult in a nation where women traditionally stayed in the home to care for the family. For that reason, the Army’s policy was to assign women to what were considered “proper” female jobs — gradually fostering public recognition that women could contribute successfully to the war effort. Office work and domestic tasks were most frequently assigned, with a minority of women eventually moving into what were commonly considered men’s jobs in repairs, communications, drafting or as drivers. The emergency of war — with the notion that women’s roles within the Army were temporary — made acceptance of the CWAC easier for Canadian society. Only men would be in combat or carry arms. Between 350 and 430 newly enlisted women were sent each month for basic training at Kitchener, Ontario, or Vermilion, Alberta, on a four-week course. Officers, mainly university graduates, were trained for eight weeks at Ste-Anne-de-Bellevue, Québec. Some recruits were assigned to additional specialized training for up to six months. In response, the Department of National Defence hired a polling firm to determine the best ways to expand both recruitment and public support. An intensive advertising campaign of posters, film, full-page magazine and newspaper advertisements, and radio announcements gradually revived the recruitment effort. "Proudly She Marches," a popular film on the topic by the National Film Board, emphasized pride, cohesion and discipline without the loss of femininity. Canada’s female force was eventually seen as confidently performing essential skills that did free up men for combat. Posters featured women standing “Shoulder to Shoulder” with men, announcing, “This is OUR Battle too." A recruiting poster for the Canadian Women's Army Corps, 1944. As more women enlisted and proved their competence, public approval grew. CWAC officers remained subordinate to men of the same rank, and in most cases, commanded only women. Almost 90 per cent of the jobs Army women performed were traditional female occupations such as cleaning or working as office personnel, as dental and medical technicians, or as telephone operators. Eventually, however, pay scales for work equivalent to that performed by men increased from 67 per cent to 80 per cent and became equal in the skilled trades. 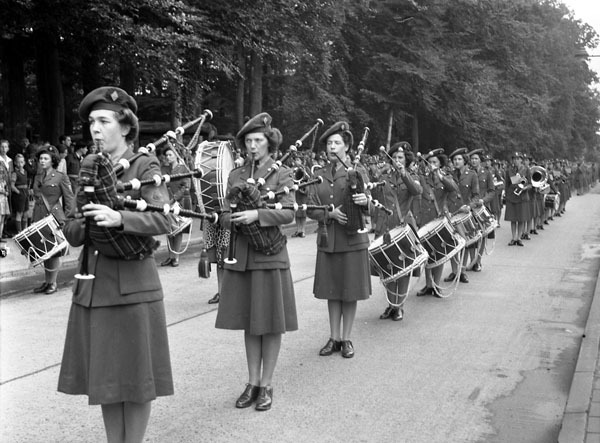 The professional CWAC uniform — khaki suit, peaked cap, military shirt, tie, hose and shoes — inspired pride and encouraged women to enter more innovative fields such as photographer, pipe or brass band musician, or entertainer with the Canadian Army Show. Molly Bobak became the first female official war artist, preparing hundreds of sketches and paintings of war scenes and CWAC personnel at work. An overseas posting was the most desired role. Three thousand CWACs served in Britain, northwest Europe, Italy, the Far East and Germany. Appointment to overseas work was highly competitive, validating a woman’s skilled proficiency and contribution to the war effort. The Canadian Women’s Army Corps served in the Second World War alongside the Royal Canadian Air Force (Women's Division), the Women’s Royal Canadian Naval Service, and the nursing services associated with all three forces. Their service was accompanied by societal fears about the erosion of traditional morality and femininity. However, the dedication and determination of CWAC members overcame these doubts, and earned them recognition that their work would bring fighting soldiers home sooner. Most assumed that when the war ended, women would return to the “normalcy” of their homes and family life. In the Army, women demonstrated their ability for training, responsibility and leadership. Joining the women’s corps provided them with opportunities most could never see in civilian life. With 55 trade categories open to them by the end of the war, the women felt they had never before performed such valuable work. Members of the women's corps were also pioneers for female soldiers in Canada’s Armed Forces today, where there is now full equality in leadership and combat roles.